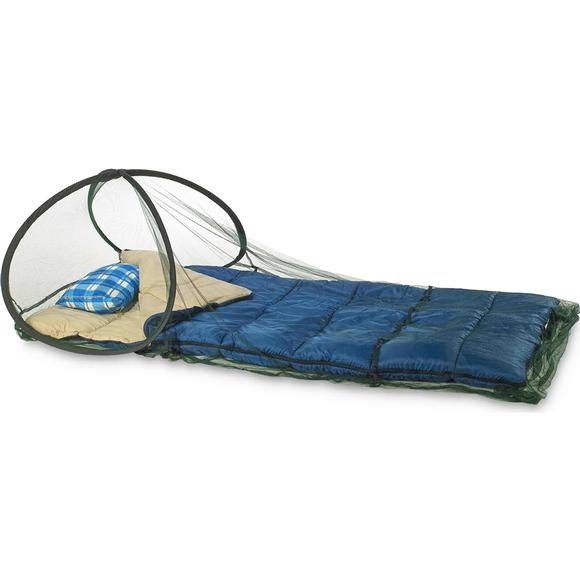 The Pre-treated Insect Shield Sleep Screen Pop-Up Net repels mosquitoes, ticks, flies and fleas so you get a good and safe nights sleep. Insect Shield Repellent Apparel and Gear like the Atwater Carey pre-treated mosquito nets and screens are revolutionary products designed to provide long-lasting, effective and convenient personal insect protection. The Insect Shield process works by binding a proprietary permethrin formula tightly to the fabric fibers of the nets and screens resulting in effective, odorless insect protection that lasts the expected lifetime of the products without re-treatment. The durable protection provided by Insect Shield apparel and gear is the result of years of research and testing. Measurements 5' 5" x 8' 10"